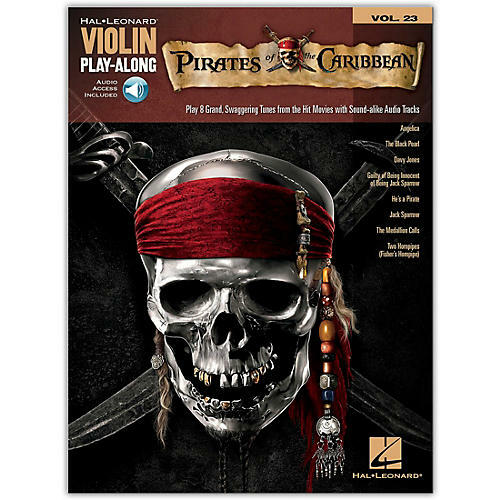 Another edition of Hal Leonard's Violin Play-Along series, the Pirates of the Caribbean songbook and Online Audio will help you play your favorite songs quickly and easily. Just follow the music, listen to the Online Audio to hear how the violin should sound, and then play along using the separate backing tracks. With the melody and lyrics included in the book, you may also choose to sing along. Chord symbols are provided should you wish to elaborate on the melody. The audio Online Audio is playable on any Online Audio player, and also enhanced so Mac & PC users can adjust the recording to any tempo without changing pitch! Includes songs: Angelica ¢ The Black Pearl ¢ Davy Jones ¢ Guilty of Being Innocent of Being Jack Sparrow ¢ He's a Pirate ¢ Jack Sparrow ¢ The Medallion Calls ¢ Two Hornpipes (Fisher's Hornpipe).